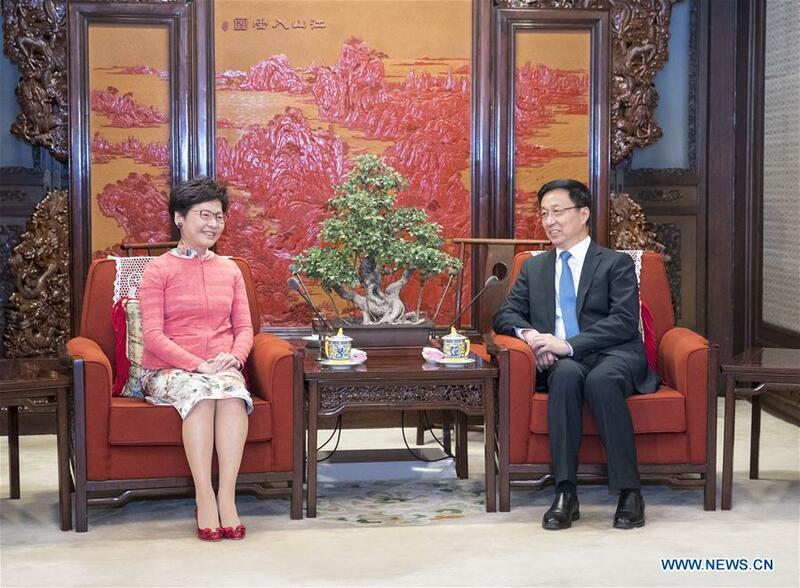 BEIJING, June 26 (Xinhua) -- Vice Premier Han Zheng on Tuesday met with Chief Executive of Hong Kong Special Administrative Region (HKSAR) Lam Cheng Yuet-ngor in Beijing. Han, also a member of the Standing Committee of the Political Bureau of the Communist Party of China Central Committee, heard Lam's comments and suggestions on the master plan for developing Guangdong-Hong Kong-Macao Greater Bay Area. Han said Guangdong, Hong Kong, and Macao should draw on each other's strengths, seek win-win cooperation and common development in developing the greater bay area. The outcomes should be shared by the vast majority of people in the region. Han said he hoped that Hong Kong can seize the historical opportunity and leverage its strength in finance, shipping, trade, and other professional services sectors to take part in the endeavor. Lam said she believed that the greater bay area would bring Hong Kong new development opportunities. The people of Hong Kong hold high hopes for it, she said.